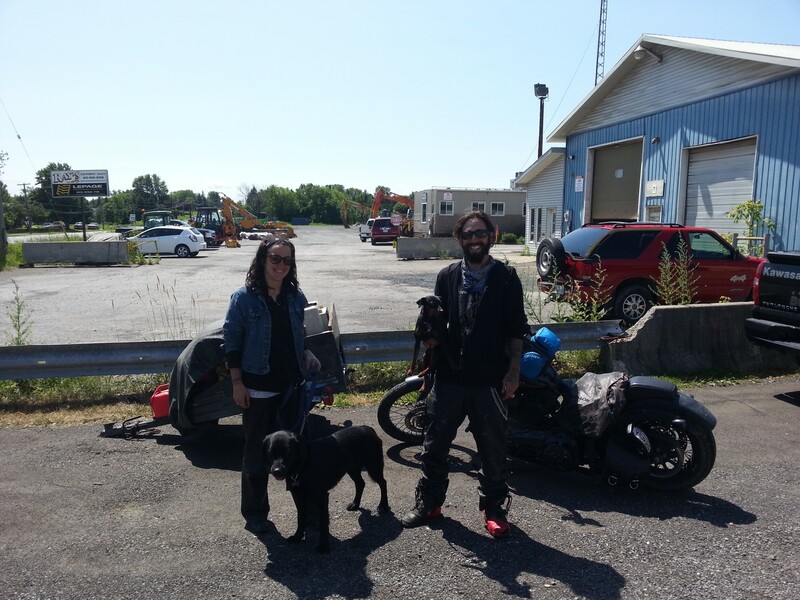 Yesterday, I met the nicest young couple at a local motorcycle garage. Both are travelling across Canada with next to nothing to their names. Dustin just left the military last year and Deidre left her job working with children to hit the open road looking for some adventure. We spent hours talking about their adventures since they have left Nova Scotia, Canada . Eating cold canned beans, sleeping under bridges to getting one of their 1980’s softails ( which looked more like Frankenstein bike that was spray paint, and full of dings and welds) stuck in the deep mud as they looked for a camping spot off the main roads. They are also travelling with their two dogs. One is a lab/collie mix that rides along in a make shift trailer, and there miniature doberman that rides in a back pack held apart with coat hangers that is strapped to Dustin’s tank. I could have spent many more hours talking to them. Neither Dustin nor Deidre have Facebook or computers. In fact they have one cell phone that has about 1000 cracks in the glass that they use to make calls and occasionally connect to the internet via wifi when they can. ohhh that is what it is all about. Have nothing, Want nothing, Just driving. BTW.. Check out Dustin boots. If you see them on the road or passing through your town why not invite them out for a coffee. Sweetest couple you will meet and full of great stories. They are heading West across Canada. Presently they are in Ontario. There can be a lot of debate out there over what ” true adventure” biking is all about. Some folks say every ride on a bike is an adventure, while others say you have to travel far and wide into uncharted waters for it to be a true adventure. Whatever side of the fence you land on I am sure you will agree that these two young people are on a true adventure. A few souls just like them ended up out here in the woods of Alaska just like me. Hope they pass by the door is always open.